US army whistleblower Bradley Manning was found not guilty of aiding the enemy, but found guilty on 20 other counts on Tuesday, meaning he could still face up to 136 years in prison. Sentencing proceedings began on Wednesday and may last up to a month. 10:19 GMT: Judge Colonel Denise Lind, the military judge who will decide how much prison time Manning will serve, said Friday that his actions were “wanton and reckless.” Lind found Manning guilty last month of 20 criminal counts, including espionage and theft, and will begin deliberating his sentence on Monday. He could face up to 90 years behind bars for leaking 700,000 US diplomatic cables as well as battlefield reports and graphic helicopter footage. The first witness, Carr, claimed that allowing its young analysts to have access to classified information was “hugely important” to the US military. 16:20 GMT: Former United States Assistant Secretary of State for Public Affairs, Philip J. Crowley, has spoken out over Manning's impending sentence. PJ Crowley just told MSNBC they “never should have charged Bradley Manning with aiding the enemy” and said a 20 yr sentence is long enough. 15:00 GMT: Brigadier General Robert Carr has been taking stand, establishing qualification as an expert. 14:10 GMT: Manning is now being referred to as "the defendant" rather than "the accused" by the judge. 14:00 GMT: It has been established that Manning will get 1,274 days off his final sentence for pre-trial confinement. This includes 1,162 days of pre-trial detention and 112 days sentencing credit for unlawful pretrial punishment after being forced to suffer treatment in Quantico deemed "cruel and inhuman" by a UN torture chief. 13:00 GMT: The Bradley Manning Support Network's Nathan Fuller has published a screenshot of the Government witness list for the pre-sentencing phase. Many names are censored, suggesting they are witnesses who haven't yet testified. those marked with a star are classified. 12:00 GMT: Journalists are arriving at Fort Meade for the sentencing phase of the trial. 11:15 GMT: Expressions of support for Manning continued well into last night. 10:45 GMT: The Russian Foreign Ministry’s Commissioner for Human Rights, Democracy and Supremacy of Law Konstantin Dolgov has condemned the the US for “applying double standards” regarding Manning. He expressed hope that the US would observe human rights standards in the Manning case, as well as in other cases. 05:25 GMT: General Counsel at the National Whistleblowing Center David Colapinto believes that Manning’s verdict will make it more difficult for whistleblowers to reveal information to the public, especially with government agencies on the lookout for leakers. “There has been a chilling effect in the US on whistleblowers as a result of the government’s overreaction to this case,” Colapinto told RT. 05:20 GMT: Harsh treatment of Manning does not necessarily mean that other whistleblowers will be afraid to come forward, argued WikiLeaks spokesman Kristinn Hrafnsson. “We have seen that despite the way that Bradley Manning was treated, being tortured in prison, in isolation, in solitary confinement for almost a year – it hasn’t stopped whistleblowers. There are still brave people out there, who act on their conscience and with public interest in mind and have blown the whistle. That’s not going to stop,” Hrafnsson told RT. 05:15 GMT: Political analyst Mark Mason argues that Bradley Manning’s conviction makes it likely that the US will prosecute WikiLeaks founder Julian Assange. “This is really all about the attack on journalism, WikiLeaks and Julian Assange, he is the one they want to catch,” Mason told RT. 04:00 GMT: A crowd of around 100 people assembled to take part in a rally at Dupont Circle, which then marched on the White House. Life-size puppet versions of both Manning himself and the Statue of Liberty were visible. "In this day and age, in our society, telling the truth is illegal, and the actual war crimes that Bradley exposed apparently are not, and I just think that's reprehensible," Barry Knight, a protester, told Washington-based radio station WTOP. 00:27 GMT: American Civil Liberties Union has issued a statement expressing its relief that Manning was acquitted of aiding the enemy, adding that the government was seemingly “seeking to intimidate” the future whistleblowers with that charge. 20:40 GMT: WikiLeaks founder Julian Assange issued a statement in response to today’s verdict. Assange believes that Manning’s conviction on 19 counts “for supplying the press with information,” and five counts on espionage, represent judicial overreach. “This is the first ever espionage conviction against a whistleblower. It is a dangerous precedent and an example of national security extremism. It is a short sighted judgment that can not be tolerated and must be reversed. It can never be that conveying true information to the public is ’espionage’." "The only ’victim’ was the US government’s wounded pride, but the abuse of this fine young man was never the way to restore it," adds Assange. In his statement Assange points to what he believes are improprieties during the court martial, including the judge allowing government prosecutors to “substantially alter the charges after both the defense and the prosecution had rested their cases,” which has caused wide consternation among Manning’s supporters. Assange also calls out president Obama’s 2008 campaign platform, which included praise for whistleblowers and justification for their protection, as outlined in a website called Change.gov which the Sunlight foundation this week discovered has recently been removed from the web. 19:50 GMT: Reporters Without Borders has said that the verdict "threatens the future of investigative journalism." Glenn Greenwald, the journalist responsible for publishing former NSA contractor Edward Snowden's leaks, has urged journalists to sit up and take notice of the ruling's implications. 19:35 GMT: The full verdict has been published online by the Press Freedom Foundation. 19:20 GMT: The Bradley Manning support Network's Nathan Fuller believes the employment of the outdated Espionage Act against Manning is ridiculous. Sorry, but 'aiding the enemy' acquittal is red herring for dangers to Manning personally and America generally. Espionage Act is outrageous. The Center for Constitutional Rights voiced frustration at the act as well, releasing a statement labeling it “a discredited relic of the WWI era, created as a tool to suppress political dissent and antiwar activism." 18:40 GMT: Kristinn Hrafnsson, WikiLeaks spokesman, told RT that he was "pleased" that the "ludicrous" charge of aiding the enemy was thrown out (it "would’ve meant, basically, that proper journalism was treason" he claimed) but had harsh words for the presiding judge, Denise Lind. "When you think about how this trial has been carried out by Judge Lind, one isn’t filled with any optimism. Last week, the judge allowed the prosecution to change some of the charges on the last day of the trial. The trial has been partly closed off to journalists. Journalists have been intimidated." 18:32 GMT: Independent journalist Xeni Jardin reports that military spokespeople say that Manning would be likely to serve his term at Fort Leavenworth, a low-level Army correctional facility in Kansas. Manning is so far credited with serving 112 days of his term. 18:25 GMT: Hacking collective Anonymous have responded with a typically strident statement. 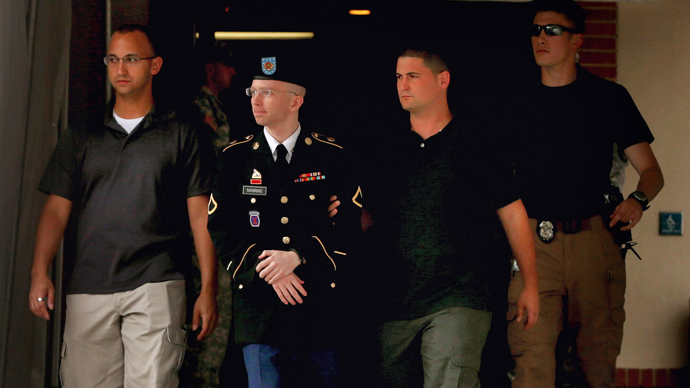 18:10 GMT: Manning's family has issued a statement. 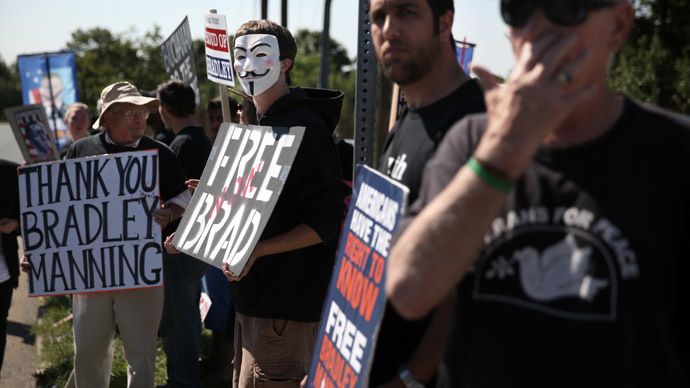 "While we are obviously disappointed in today’s verdicts, we are happy that Judge Lind agreed with us that Brad never intended to help America’s enemies in any way. Brad loves his country and was proud to wear its uniform." 18:05 GMT:"This is a historic verdict," Elizabeth Goitein, a security specialist at New York University's Brennan Center for Justice, told Reuters. "Manning is one of very few people ever charged under the Espionage Act prosecutions for leaks to the media ... Despite the lack of any evidence that he intended any harm to the United States, Manning faces decades in prison. That's a very scary precedent,"
17:55 GMT: Here is a breakdown of the charges Manning was found guilty of. Other than aiding the enemy, Manning was cleared of espionage in connection with the video of the Garani Air Strike - in which scored of Afghan civilians died. While the video appears to have been in Manning's possession, it has never been made public. 17:45 GMT: Human rights advocacy group Amnesty International has sharply criticized the verdict. While it welcomed the lack of a conviction for aiding the enemy, it said the charge was an "overreach" by prosecutors in the first place. It has condemned the lesser indictments. “The government’s priorities are upside down. The US government has refused to investigate credible allegations of torture and other crimes under international law despite overwhelming evidence," said a statement on Amnesty's website. 17:39 GMT: Wikileaks and Bradley Manning Support Network have expressed a mixed reaction to the sentencing, and show every intent of continuing the legal battle through appeals. 17:35 GMT: Manning's sentencing hearing will begin at 9.30 am Eastern Time (1.30 pm GMT) tomorrow. 17:26 GMT: Wikileaks has already calculated the possible term Manning could be forced to serve on those charges for which he was found guilty. RT @carwinb: Manning faces 136 year MAX punishment on the crimes he was found GUILTY-- sentencing begins tomorrow. 17:08 GMT: Manning found NOT GUILTY of aiding the enemy, but guilty on 20 other counts including five counts of theft and "wantonly cause to be published on the internet intelligence belonging to the US government." While avoiding the most serious charge, which carries a penalty of life imprisonment without parole, he could still face a maximum of more than 100 years in jail, having been found guilty of the majority of the 22 criminal counts. He was found not guilty of violating the espionage act for the collateral murder video. 16:56 GMT: Court assembles to hear verdict. 16:50 GMT: One courtroom reporter asked, "is there a reason we don’t have Internet 20mins before trial?" The army responded: "That’s a good question, guess were gonna have to find out." If #Manning is found not guilty of Aiding the Enemy and guilty of everything else, he faces 154 years in jail. 16:40 GMT: Internet is fairly volatile, as predicted. #Manning verdict announcement to begin in 20 minutes. Limited Internet at Ft. Meade, but we will bring you updates asap. 16:30 GMT: It is now only half an hour until the Manning verdict is read out. 16:15 GMT: The press has been instructed not to leave the courtroom while court is in session. The prosecuting attorney's office has said that the judge is tired of press "shenanigans." 15:50 GMT: RT's courtroom correspondent Andrew Blake has finally entered the media center at Fort Meade after having his belongings searched by armed military police. He foresees that "internet could be terrible." As was the case with earlier court proceedings, reporters won't be allowed to update the public live from the courtroom. Media: #Manning reporters aren't allowed to use phones in the media center, will have to rush out after verdict. Best to send email. 15:40 GMT: Alongside the courtroom protesters, people are paying tributes to Manning on Twitter under the hashtag #ThankYouBradley, airing their gratitude for what the world has become more aware of because of the information he passed on. 15:20 GMT: The media line is beginning to shift as people head towards the courthouse. There is a sense of unease among some of the protesters. "They are nervous that something might happen." Journalist at #Manning trial says not to be surprised if people are detained after trial. 15:10 GMT:"He's just a dumb kid who got himself into a situation where he felt he was saving the world," Joseph Wippl, a professor of international relations at Boston University and a former CIA officer told Reuters. "I think he should be convicted and they should be easy on him. They need to do more on limiting access to classified information." Director of the Center of Investigative Journalism, Gavin Macfadyen, told RT that Manning's motivation seemed to be "a genuine dislike of what he has been asked to do or what the army was doing in Iraq. He thought that the crimes committed by the army should be made public...he broke the law in getting most documents and sending them out to WikiLeaks. The justice of what he did is another matter." In regards to the impact of Manning's revelations, Macfadyen said that he had hopes that they had made a long term impact. "I think one of the effects is the hope that we always hope we will make a difference," he said. 14:15 GMT: Around 40 protesters are present at Fort Meade. The activists are chanting "Free Bradley Manning" and "Three Years is Enough." 14:05 GMT: RT's correspondent Andrew Blake describes the media parking lot at the courtroom as "already packed," despite check-in not beginning for another hour. 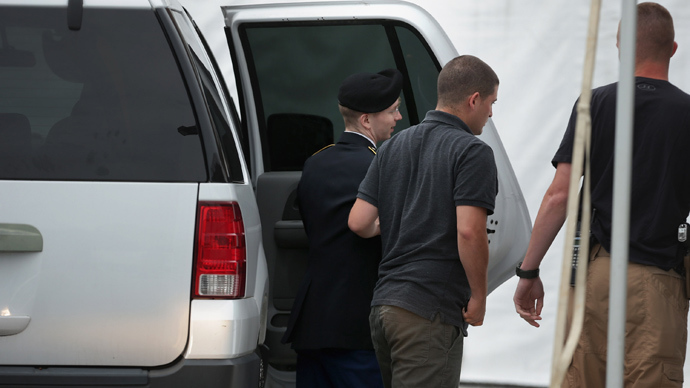 14:00 GMT: Bradley Manning has arrived at Fort Meade ahead of today's verdict. 13:25 GMT: A crowd has already started to gather outside Fort Meade to hold a rally support of Manning. 13:00 GMT: In a twist of irony, a US senator is lobbying for today to be declared 'National Whistleblower Day' in honor of the revolutionary-era Continentall Congress' very first whistleblower protection law on July 30, 1778. "Anything we can do to uphold whistle-blowers and their protection is the right thing to keep government responsible," Iowa Senator Chuck Grassley said on Monday. "If you know laws are being violated and money's being misspent, you have a patriotic duty to report it." 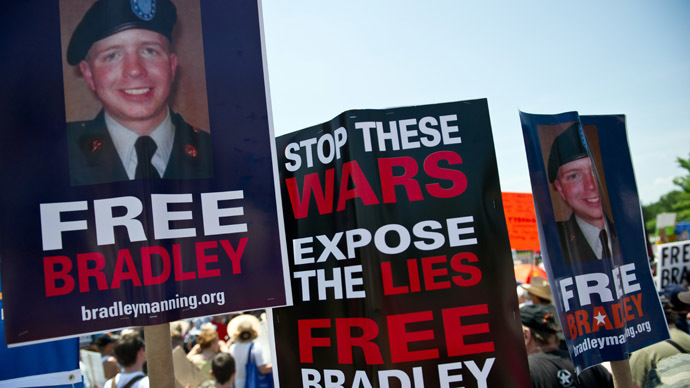 12:30 GMT: European Parliamentarians have signed an open letter to US President Barack Obama, calling on him to free Bradley Manning. "On July 2nd , Army prosecutors closed their arguments in the case without having provided any real evidence that Bradley Manning aided the enemy, or that he intended to do so," says the letter. The 17 signatories of the letter include Members of the European Parliament from France, Sweden, Germany, Ireland and Spain. 12:15 GMT: Julian Assange's mother, Christine, has tweeted her support for Manning. 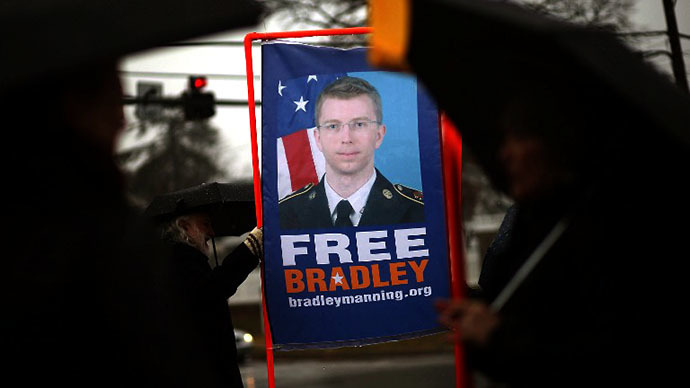 11:54 GMT: As a US military judge deliberates the fate of Bradley Manning, activists in dozens of cities took to the streets across the world to show support for the whistleblower. Demonstrators in 40 cities took part in the Bradley Manning ‘International Day of Action’ on Saturday. 08:10 GMT: Members of the Free Bradley Manning support group have scheduled a 90-minute vigil in front of Fort Meade’s main gate. The event is to start at 7 a.m. local time and will be followed by a procession to the courtroom. 06:35 GMT: Manning has already pled guilty to 10 of 21 charges related to giving secret documents to Wikileaks. The prosecution argues Manning acted with malicious intent and gravely harmed US national security. Denver Nicks, who has written a book about Manning, told RT that there is no evidence of that - and he believes the whistleblower doesn't deserve to spend life in prison. 06:05 GMT: RT's Gayane Chichakyan reported that the US media may have already declared Manning guilty in the court of public opinion before an actual verdict was reached. 06:02 GMT: Manning was responsible for the largest leak of classified documents in US history. To learn more about how Manning handed over more than 700,000 cables, his arrest in Iraq in 2010 and how he spent 1,100 days in pretrial detention before the court-martial began in June, watch RT’s video below. 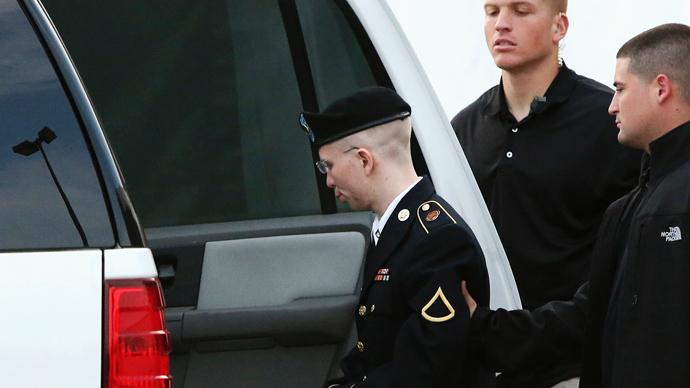 06:00 GMT: Col. Denise Lind, the presiding judge in the court-martial of the United States v. Pfc Manning, said Monday morning that the long-awaited verdict will be delivered at 1 p.m. EDT from the military courthouse at Ft. Meade Army Base outside of Baltimore.